This deluxe cooling gel mattress was designed for patients that spend more time sleeping and in their recliners during the day. The recliner chair mattress is divided into multi zones. 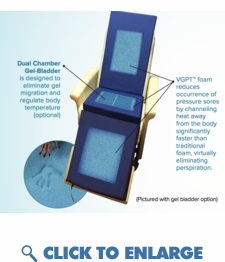 The seat area is made up of high-resilient foam with a water-based gel bladder to help redistribute pressure. The water based gel removes painful pressure points, heals bedsores, and redirects pressure over a wider surface area. Multi zones prevent the gel from pooling to one area. The head and back sections are made up of a 5Lb disco cooling gel memory foam that comfortably contours to the patients body for optimal comfort. The heel section utilizes Lura-QuiltTM, a revolutionary foam. Lura-QuiltTM is aerated foam which allows air to pass through the foam to keep the patient cool and dry while providing superior pressure redistribution. The cover is low shear and is constructed of a multi-directional waterproof stretch nylon. The cover allows air to pass through to keep the patient cool and dry. The bottom cover has a unique rubber non-skid material for patient safety.